If you’re sure that you need to purchase a truck for the drive you need to make on a daily basis, your thought will turn to a large truck. What you normally picture when you’re thinking of buying a truck is a body on frame model with a V8 engine and solid axles. Unless you’ve got to haul a large boat on a regular basis or carry a seriously heavy load in the bed on a daily basis, you don’t need this much truck at all. In fact, the Honda Ridgeline is more than enough truck for what you need to do. Thankfully, Honda offers us the newest form of the Ridgeline to look and act the way we want. The previous version of this truck was unique and interesting, but that uniqueness wore off quickly which caused Honda to delete it from the lineup for a few years. After a return for the 2017 model year, the Honda Ridgeline shows us that it has what we need when it’s time to get things done. This new version of the truck can pull up to 5,000 pounds behind it and offers you the ability to go where you need to. The truly impressive qualities of what the Honda Ridgeline brings to you are found during the ride. The Ridgeline is a unibody pickup truck that looks more like a conventional truck than it was in the past. This means you’re going to have a smooth ride that feels more like the one you enjoy in the Honda Odyssey, which shares a powertrain with the Ridgeline. Because it’s a unibody construction, the ride is smooth and enjoyable, which is a huge difference from a normal body on frame truck. 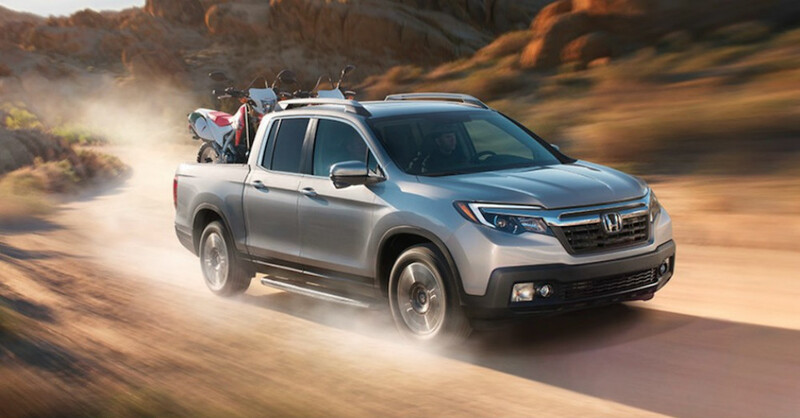 Most trucks come with the trade-off of gas mileage for power, but not the Ridgeline. This is a truck that makes use of a 3.5-liter V6 engine under the hood that pushes out 280 horsepower to give you a fuel mileage rating of 18 city/25 hwy mpg when you drive. This engine is attached to a six-speed automatic transmission to make sure you have the smooth shifting and qualities you want when you drive. With this powertrain, the Honda Ridgeline can be a perfectly comfortable daily driver and be the right one for you to get things done when you need to. When you get inside the cab of this truck you’re going to find that a fully-loaded model has every creature comfort you can ask for. You’ll see leather upholstery, heated and power-operated front seats, a heated steering wheel, keyless starting, a navigation system, a moonroof, LED headlights, parking sensors, a truck bed audio system, a class III trailer hitch, and the Honda Sensing safety suite of active driver assist technology. Get behind the wheel and begin to drive the truck that’s everything you need while offering the comfort you want every day. Looking for something a little smaller? Opt for the Honda Accord, a sedan with style.